Stellar Lumens (XLM) recently had an explosive move to the upside before settling back in for a pause. Could it be setting up for another launch soon. Let’s take a look at the charts are showing. First, what is Stellar? According their website, Stellar is a platform that connects banks, payments systems, and people. With this platform, you can “integrate to move money quickly, reliably, and at almost no cost.” Essentially, they are using blockchain technology to create platform for banking and payment remittances. Similar to what Ripple (XRP) is doing, they banks and institutions to replace the slow and costly SWIFT system with this type of technology. However, Stellar has yet to sign up a large number of big banks and Ripple leads in this space. Stellar is the network system and Lumens are the tokens, or units of digital currency in this system. Hence the term Stellar Lumens. 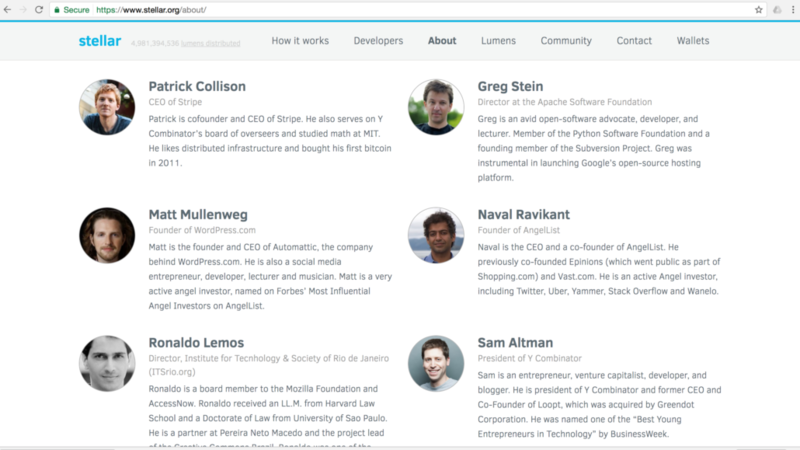 Stellar has close connections to Silicon Valley leaders and it’s board and advisors include leaders from Stripe, WordPress, Y Combinator & AngelList. Ripple has seen a lot of institutional support as of late and with they signing on more banks, the market cap for Ripple (XRP) has ballooned to over $7 Billion. Conversely, Stellar has only recently gone from a $48 Million market cap to just shy of $400 Million. To put it into perspective, Stellar is only worth 5% of what Ripple is worth (as of this writing). If Stellar has long-term potential, picking some up here may prove to be a lucrative investment. 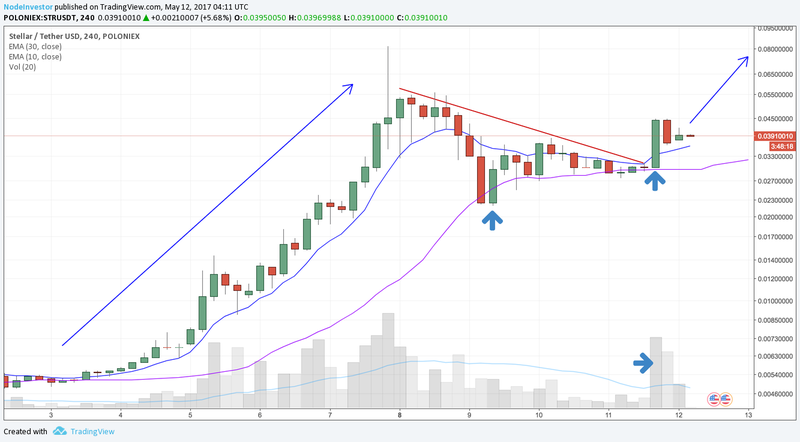 Let’s take a look at the recent charts and price action on XLM. Over the past couple of weeks, Stellar (XLM) has had a 10-fold move going from $0.005 in early May to $0.05 in just a few days. Much of this move could have been sentiment spillover from Ripple since both platforms are in the same market segment. However, as noted, Ripple is far ahead in terms of number of institutional customers signing on. Following the big move up, Stellar then pulled back sharply but found support at $0.022. Since then, the shorter-term moving averages have caught up and it looks like Stellar wants to resume its uptrend here. A sustained close above $.037 will confirm this next leg up has begun. It is sure to meet resistance again above $0.055 so that will be the near term target. Beyond that, it’s new highs and there’s no telling how high Stellar could go. It’s market cap is tiny compared to that of Ripple ($330M vs $6,688M) so it would not be surprising to see Stellar double or more from here. We should keep an eye on Stellar Lumens. Top 5 Cryptocurrencies – Technical Analysis & Chart Review DASH Breaks Out To New Highs!